Robust construction in brick and steel: The village school in India, Oct. 2006! „Tu was!“, Just do something! So read a sign near the entrance of the cultural centre of the Thomas parish in Freiburg (Germany), which was the location of the second charity event to the benefit of our school. 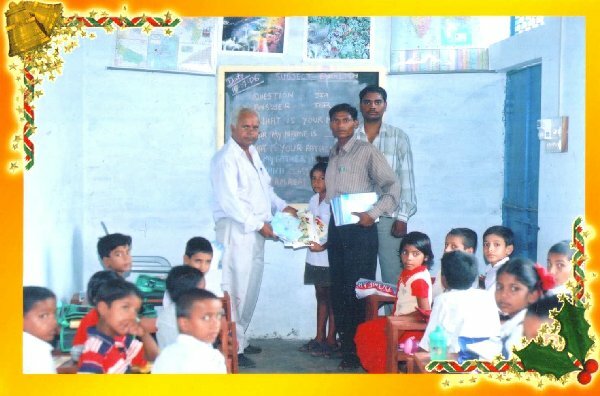 On January, 28th, 2006, some 160 people from all over the world came once again to get actively engaged in helping the village children of India. Donations on January, 1st, 2006, amounted to 2.018,09 € . Total aid for the construction project so far, i.e. since Novermber, 30th, 2002, runs up to 20.000 € ! 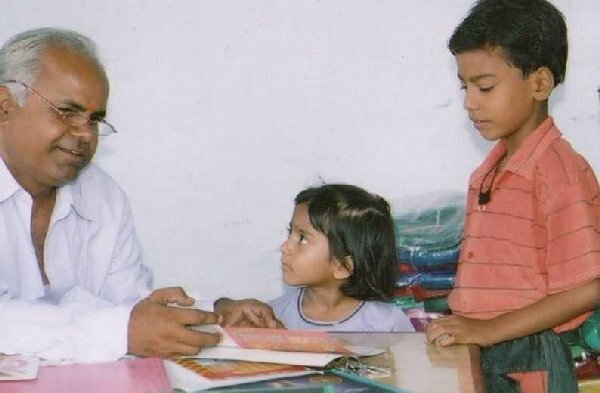 Initially, when I decided to organise education, and hence, a better start into life, for the village children, I was quite on my own. During my visit to the dirty little hospital I saw patients, who, due to lack of beds, would lie in the yard, on the concrete floor, or under the stairs, next to the rattling and steaming diesel engine. Those images haunted me into my dreams, as did my experiences in the operating theatre. And yet, rather than providing aid to the sick, I decided to build a school. A school which might, eventually, put students into the position to improve the situation in that hospital. I wanted to fix the problem by its very root, not just on the surface! And, I wanted to invest my energy into a project for which the funding does not get wasted to a large administration body, or to expensive logistics but instead goes directly, yet controlled, into the construction and maintenance work for the school, for the benefit of the children in Jerar/Bah zugute kommt. By no means is this an easy undertaking for a private person. It involves lots of red tape, travelling costs to ensure proper use of the money, lots of phone calls and SMS, tedious accounting work, etc. You find yourself confronted, all of a sudden, with brick suppliers and builders in India, with paint merchants, farmers and land owners, mayors, municipal clerks, city councillors, and young teachers applying for a job. You will strive hard to acquire some knowledge in various professional areas such as construction work. You will spend your time on the phone, chatting to some Indian civil servants 6.500km away to make them more „inclined“ towards your endeavour. Over here in Germany, you find yourself in discussions about whether development aid makes sense at all, about politics, world economy, and the like. „Why don’t you spend your time on something else, Elena? Will we not damage ourselves when we try to bring other countries to our standards?“ Quite on the contrary! Everybody may think what they please. But it is a fact that the huge discrepancy between the rich and the poor on this small planet is, on the long run, not really an advantage for the rich, industrialised, countries. Envy and greed will be the normal reaction of the poor countries, who are very well aware of our wealth. At the end of the day, poverty, and lack of education, will help pave the way towards terror. Like it or not: Development aid secures our own future as much as that of those unknown poors. Eventually, each form of exploitation comes at a high price. Viewed from that angle, our help is just a form of rational, future-oriented, even egoistic, behaviour. Would German companies continue moving the production to low-wage countries if those nations were no longer depending on the employers in the Western World? Could our help not – in the long run – even help to reduce our own unemployment figures and thus the big gap between rich and poor in our own country? Without low-cost production abroad companies might as well stay here, close to the home market. Most people prefer to make donations in exchange for something. However, I do not want to invest all the painstakingly collected money into glossy brochures, or Xmas cards. That is not what it is for! That is why I organised, with the help of a few very supportive people, two charity events with entertainment programmes. I would like to extend my big thanks not only to those who donated money but also to all the volunteers who invested so much effort and time into the preparation. The positive reaction to the event showed it was a clear success. 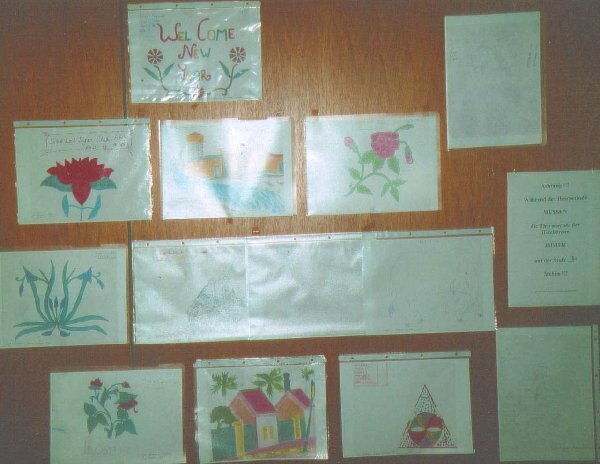 The appropriate use of the donations has been documented by photographs as well as receipts. Next spring I am paying another visit to the school to check on the progress and renew the documentation. On request, a new report will be available. Whoever wants to join me on the trip, should call me up soon! In Bah, there had not been any computers so far. Brahm Datt Sharma, co-founder of the school and local responsible, is currently acquiring basic knowledge as to the use of the donated laptop computers. Truly not an easy task for a person with a rather low education profile. On this occasion, many thanks to the sponsors Swiss Re in Switzerland, and CSI in Luxemburg for their generous support! Also I would like to say thanks to german teacher Brigitte Kröger, member of Deutsche Zentrale für Globetrotter (www.dzg.com ), who, on her very first trip to India, got us in contact with business Amit Banerjee. Amit took over the accounting work for the school project. On the school’s roof, there has already been installed a water tank, enclosed by cooling brick, so as to ensure constant supply for the children. Otherwise, they would have to rely on that little trickle from the community supply, catering for the village houses only for an hour or so per day. Already, a small school yard has been opened, and uniforms were purchased in order to narrow the gap between students of different social background. Now, what is needed is the funding for interior decoration, benches, window grills to keep the monkeys out, books and writing material, as well as recurring expenditures like salaries for teachers. A more distant goal would be a small bus, providing access to the school for children from very remote villages. Another project is to grow and cultivate a fruit bearing tree in teamwork; to collect the harvest together, and have fun climbing on it. The idea behind it is to encourage the kids to take responsibility and care. To the same end, a small garden bed for herbs and flowers is planned. It is not foreseen to hold another big charity event for this project. It is just too much effort at the moment. Nonetheless, I will keep organising small private parties in order to raise some funding for the benefit of the school and the children attending it. Who would like to come and visit me for a charity dinner, or for a colour-slide show on the bicycle tour, and, in exchange for it, make a little donation? Gladly, I will keep forwarding your kind donations to the school; and I hope sincerely you keep up your personal involvement. 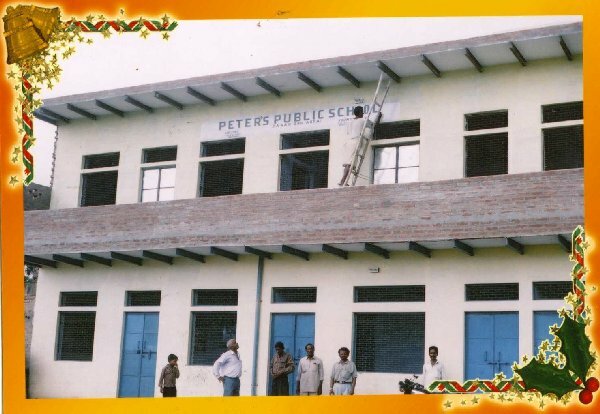 We managed to erect a two-storey school building with extremely low financial means, even by Indian standards, thus providing the basics for a good, and broad, education. This was possible thanks to the careful and cost-effective local management by Brahm Datt Sharma, as well as the help from some supportive local businesses and authorities. I would appreciate it if some of You would be prepared to contribute some more money in order to cover the running costs. What does not hurt us a lot, will be a big help to the children in India! It is not over and done after construction of the building. There is also recurring maintenance cost, and, there are some very poor students, who should be supported so they can attend the teaching. I have looked into their bright, smart, faces, and I know it is worth it. A potential that needs to be developped. and can be controlled by everyone themselves! In order to keep postage costs for this letter at a low level, I would like to encourage everyone to pass it on, or copy it, for their friends and relatives, whoever is interested in, or already engaged in our project. It is not my intention to waste your money on unncessary expenditures in Germany, but to forward it to its due destination, our common project, the school in India.